So you’ve seen Uluru, flown over Lake Eyre and paid a visit to the Bungle Bungles? Here are 20 more must-do activities to add to your outback itinerary that aren’t always found on the tourist map, writes Alissa Jenkins. Stop at the lookout above Tnorala (Gosse Bluff), a remnant crater formed over a million years ago when an asteroid hit earth. It’s also a sacred Aboriginal site, found 175km from Alice Springs along Namatjira Drive, NT. Head underground into the Chambers of the Black Hand at Lightning Ridge in NSW, and discover an unusual art gallery featuring images carved into the sandstone walls, such as faces of past Australian prime ministers. 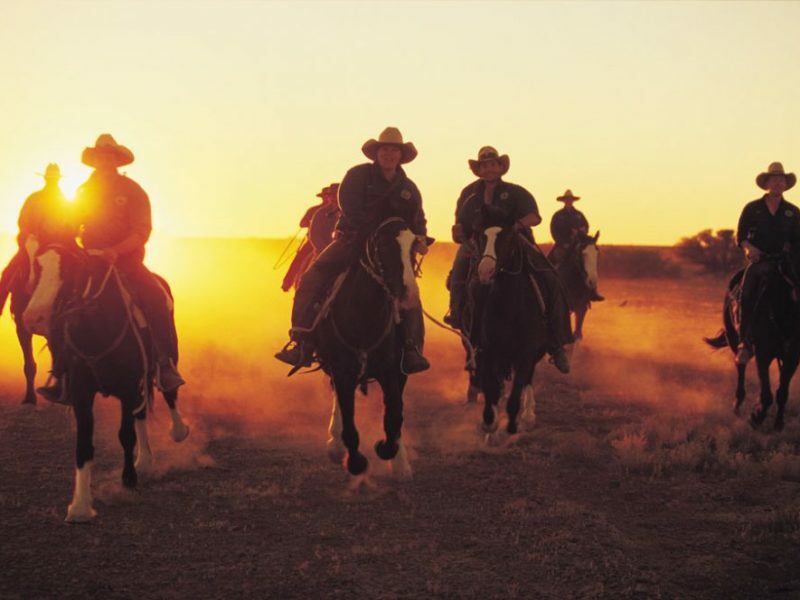 Saddle up for the annual Great Australian Outback Cattle Drive, where you can herd cattle among drovers along the Oodnadatta Track, SA. Various tours available, so you can ride for as long as you like, with all camping and horse gear provided – no horse riding experience required. Take a walk on the wild side through Alice Springs Desert Park, featuring rivers, woodland and sand country, as well as exhibits and an abundance of native wildlife. See free-flying birds of prey and rare animals in the nocturnal house, and enjoy a cinematic display showcasing 4.5 billion years of desert evolution. Admission from $20 for adults, $10 for children. Discover the ancient art of dot painting with an Aboriginal artist at the Uluru Cultural Centre. The workshop gives an insight into local Indigenous culture and how it is expressed through dot painting. Take home your artwork as a memento of the experience. $69 for adults, $35 for children, art supplies included. Scale the rim of Kings Canyon within Watarrka National Park in NT, overlooking spectacular red and white sandstone walls up to 270m high. The walk continues into the chasm to an unexpected oasis – a natural spring waterhole known as the Garden of Eden, which is surrounded by lush vegetation including large prehistoric ferns. Walk through the outdoor art exhibit Inside Australia, which comprises 51 sculptures by UK artist Antony Gormley, set on a 10-square-kilometre salt lake in the WA Goldfields at Lake Ballard. Each sculpture represents one of the 131 local residents whose bodies were scanned for casts. See where the Rainbow Serpent laid its eggs according to Aboriginal mythology at Devils Marbles, south of Tennant Creek, NT. Karlu Karlu, as the site is known by the local Indigenous people, is a collection of huge, red, rounded granite boulders situated across a 1800-hectare reserve. Check out the brand-new Royal Flying Doctor Service display within the Australian Stockman’s Hall of Fame in Longreach, Qld. It opens in March and will include a walk-through experience based on a typical RFDS aircraft, as well as other interactive displays, equipment used when the service was first founded, through to today’s cutting-edge technology. Take a scenic flight over the Buccaneer Archipelago and see the Horizontal Waterfalls, a natural phenomenon caused by massive tidal movements squeezing between two close islands. It creates the effect of a waterfall flowing across the face of the ocean. King Leopold Air offers half-day tours from $470 per person. Reach for the stars at the Charleville Cosmos Centre. It offers mini talks and interactive displays –one shows how much you would weigh on other planets! The real highlight is at night when the observatory roof is rolled off to reveal three powerful telescopes that visitors can use to explore stars, planets and moons. Night-time entry from $24 for adults, $22 for seniors and $16 for children. Splash about in Katherine’s hot springs, a series of clear pools framed by native vegetation on the banks of the Katherine River. The main pool is wheelchair accessible and there is also a picnic ground and scenic walking tracks nearby. While seeing Wave Rock in Hyden in the WA wheatbelt, visit nearby Mulka’s Cave. The name comes from the Aboriginal legend about the son born from a forbidden marriage; named Mulka, he ate children and lived in the cave. Today, there are over 400 ancient Aboriginal art hand prints inside the cave, which are said to be by Mulka. Noodle for opals in Coober Pedy’s Old Timers Mine, SA, where what you find is yours to keep. While there, explore a historic 1916 opal mine, an underground home from the early 1900s, as well as the underground opal museum and gift store. Guided tours available, with entry from $19. View the Super Pit, one of the world’s largest open-cut mines, and the biggest producer of gold in Australia. Located in Kalgoorlie, WA, the mine also offers guided tours to get up close with the milling and mining. Tours start at $40 for adults, $25 for children. Sample “Flinders Feral Food” at the Prairie Hotel, SA, with dishes derived from emu, kangaroo and yabbies, quandongs, wattle seeds and other native ingredients. Stand on Broome’s beaches overlooking Roebuck Bay, and see the Staircase to the Moon: an optical illusion caused when a full moon rises during an extremely low tide to expose the mudflats, creating a reflection that looks like stairs leading to the moon. It usually occurs three nights each month between March and October. See the Walls of China without leaving Australia: just go to Mungo National Park in outback NSW. A 30km dune formation, the Walls of China protect thousands of years of history, with many well-preserved artefacts such as burials and remains of long-extinct animals uncovered there. There’s a boardwalk around this fragile environment, providing views across the ancient dry lakebed of Lake Mungo. Check out “Evenings in Alice”, a new experience for travellers to Alice Springs organised by small-group operator SEIT Outback. Themed progressive dinners include the Scandalous Crimes evening at notorious Stuart Gaol. Or if native plants are more your thing, the Infamous Miss Pink dinner introduces guests to colourful local Olive Pink, an unconventional anthropologist, botantist and champion of Aboriginal rights. Step back in time and see the world’s largest collection of Australian dinosaur fossils at the Australian Age of Dinosaurs Museum outside of Winton, Qld. Guided tours are available from $22 for adults, $19 for concession holders and $11 for children.